I love a good mystery novel, especially when the stakes are high—like, say, avenging your sister’s death. 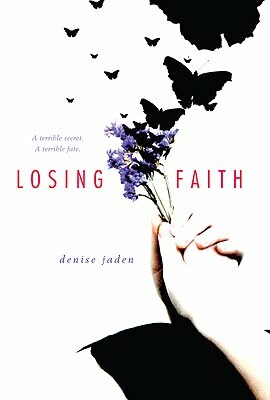 That’s why I’m very excited for GCC member Denise Jaden’s new YA novel, LOSING FAITH, which debuted this week through Simon Pulse. Denise: My husband and I used to drive from Vancouver to L.A. every year to go to Disneyland. We were young and dumb and usually did the 22-hour drive straight through, taking turns napping. I don’t know what the funniest time would have been, but the most memorable was the time it was 108 degrees through Redding and we were in a car without A/C. Denise: I’m also one of those rare authors who didn’t always “know”. For me it was about seven years ago when I sat down to write a journal, which quickly turned fictional. I had so much fun writing that I couldn’t stop. Within the year, I knew I wanted to be a real writer, writing things that others would want to read. Denise: I think we must have been separated at birth, Diana! I have the exact same story – started my early manuscripts just following my muse for the stories. With my more recent novels, I’ve used extensive outlines – one of them 38,000 words, just for the outline! Now THAT is an outline! Denise: I had houseguests at the time and was checking my email around six a.m. Because I’m on the West Coast, the publishing world of New York was already open and I had an email sitting in my inbox with the subject line reading, “Good News.” My agent had forwarded me a message from my now-editor that read, “I love it. I want it. Denise is super-talented.” Yes, I have that memorized. LOL. I tried to suppress my scream, but I guess I wasn’t quiet enough. The house guests were soon up and brought back champagne later that day. Thank you, Denise! Now, everyone go out and buy books, lots and lots of books!